The Oneplus 5T is the latest Oneplus flasghip smartphone and arguably the best deal you can get for its price at the moment as far as android smartphone is concerned. The device was launched about a week ago but had a few software issues which affected the dual camera. Now OnePlus has just released a new OxygenOS 4.7.2 update which is expected to address the problem. The new update is still based on Android Nougat and it weighs just around 107MB. 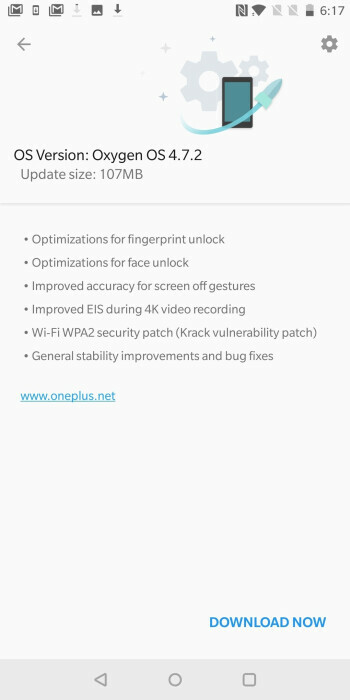 Below is the changelog of the new OxygenOS 4.7.2 update for OnePlus 5T. If you are a Oneplus 5T user, then you can go ahead and check for the update in your phone's settings, but remember that the update will be released in batches so you might not get it immediately depending on your region.